Aliases: Snipers, Farseers, Laser Demons. 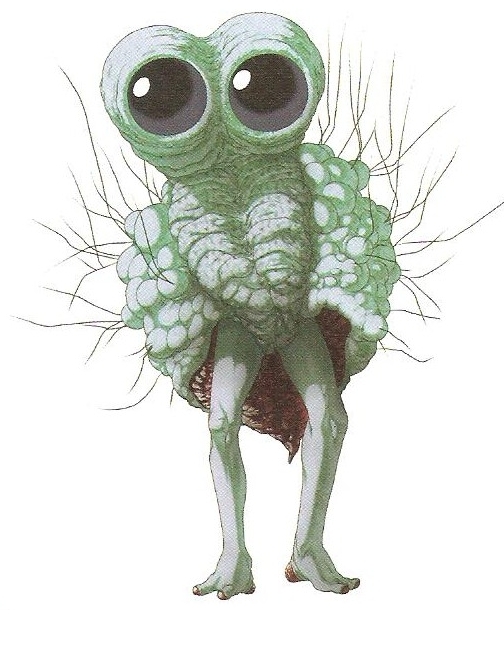 Abilities: Standing 7 feet tall, with large eyes that basically encompass a vast field of view, capable of zooming in over vast distances, and rather limp legs that struggle just to walk forth due to the great weight of their eyes, these demons are known to evaporate their prey through high heated laser beams shot through their eyes. Such effects of the laser beams has the simultaneous maiming of limbs typically, cauterization at the same time, AND comes hitting with full force in the same velocity as a .50 BMG Barrett anti-materiel sniper rifle. Typically the laser beams also travel in the same velocity too. They are an ancient demon, primordial, and have always been there since the beginning of Inferis itself, hence their rather prehistoric and strange appearance. Their mouth is located around their legs, which makes eating for them a rather slow and careful affair to them. Some say they resemble testicles with eyes from how they have feelers all around their body which helps them sense and coordinate themselves. They aren't exactly physically imposing in any way, and are easily felled by destruction of their eyes, or generally attacking them with a proper application of force to their upper body mass. They usually are slow, moving at a grandma's brisk pace whenever they would move point A to point B, which is why typically they employ stealth and would eliminate whomever has been sighted by them, be it demon or human. They are known on occasion to even attack Archdemons, only to their folly be destroyed. Being guided by primal instincts rather than any intelligence in place. They are even hostile among their own kind, which makes it a wonder how they have come to survive this long with such hostility to all in place. Miscellaneous Notes: - Can travel up to 5mph. - Laser range typically extends to 5,000 yards. - When firing lasers, their eyes flare red before shooting such concentrated firepower. - Can recognize life as they are differentiated to be colored in their vision, whereas everything is black and white to them. - When shooting lasers, there is a distinctive sound of a loud "WAAAAAAAZOOOOOOOOOOOOO" that emits. Whether it is from the laser or from them is unknown. - When they eat, they squat down to devour their quarry. - Indiscriminate in where they shoot, they cannot differentiate the head from another appendage of the body.